2 Where Are Crappie Found? Have you ever been bass or catfishing and realized you want something a little bit different? Well for many people the answer is crappie fishing. Crappie are very fun and delicious fish to catch! They fight hard and can be somewhat difficult to get to the boat from the depths of your favorite body of water. Plus they can be found in almost every body of water in North America. Crappies are in the genus Pomoxis, which are a North American freshwater fish in the family Centrarchidae which is the sunfish family. 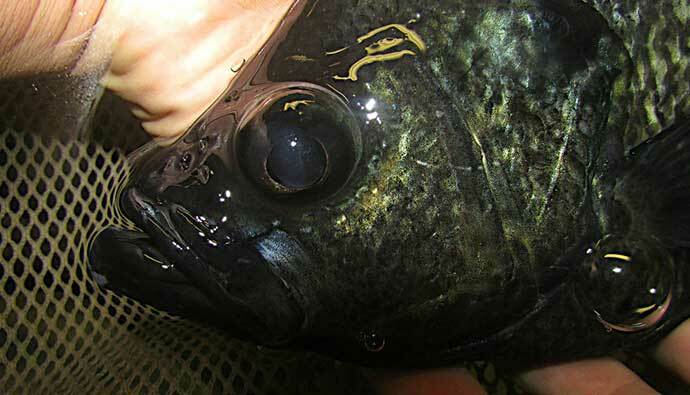 There are only two currently recognized species in the Pomoxis Genus and they are the Pomoxis annularis which is the White Crappie and the Pomoxis Nigromaculatus which is the Black Crappie. Both Species of crappie when adults feed mainly on smaller species, which include the young of the species that regularly feed on them. Including but not limited to the Northern Pike, Muskellunge, Largemouth Bass, and Walleye. They do however have very diverse diets which do include zooplankton, insects, and crustaceans. During the day crappie tend to be less active and with stay around weed beds or submerged objects. Dusk and dawn are when crappie moves into the open water or approach the shore to feed. Crappie starts spawning when the water reaches the mid 50’s in temperature, they spawn twice a year and start staging beds in 6-15 feet of water. Crappie is an American sportfish that rivals largemouth bass in many places in the United States. 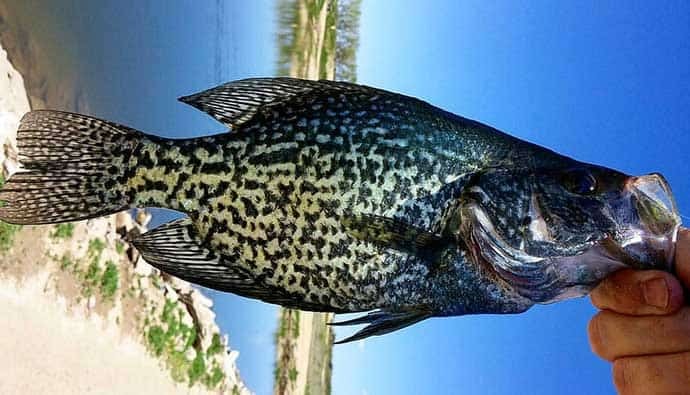 The world record white crappie (Pomoxis Annularis) weighed in at 5.2 lbs and the world record Black Crappie (Pomoxis nigromaculatus) weighed in at 5.0 lbs. A bonus, crappie are some of the most delicious fish a person can eat. They have tender flaky white meat that is very delicate when cooking. When looking for Crappie you need to first distinguish what species of crappie you are looking for. Black crappie can handle water that is a bit deeper and clearer than white crappie can. They also love cold water, this information will help you choose which kind of crappie you will be going after. Your best bet when looking for crappie is to look for the bigger ponds and the shallower parts of lakes with sand and mud on the bottom. Lakes hold a large amount of crappie due to the diverse ecosystem, there is plenty of forage and cover to allow crappie to grow to cast iron skillet sized portions! These types of cover are key to finding the perfect crappie hole! 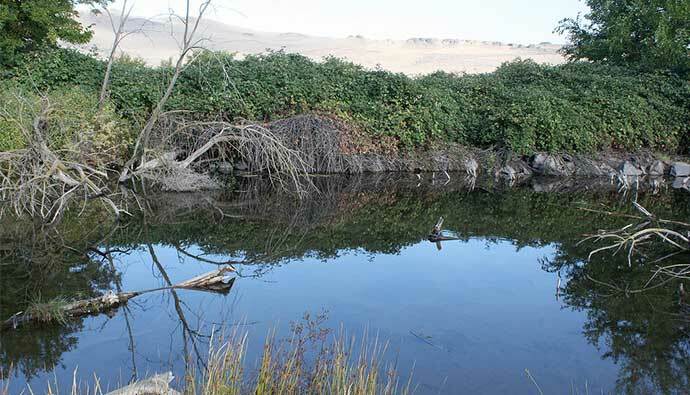 Underwater structures create shallows that allow vegetation to grow underwater. Which in turn attracts small baitfish that use it for cover from predators. Crappie is in most freshwater waterways in North America, as well as many fishermen have been stocking them in ponds to replace largemouth bass for decades. When an angler decides he is going to go for crappie, they’ll need to pick a light action rod with a small 500-1000 model reel that is spooled with 2-6 lb test. 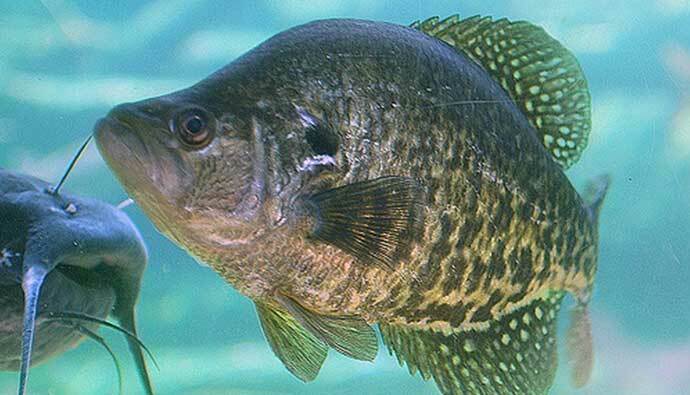 The reason for this is because crappie has small mouths, although they have the biggest of the sunfish family. Just remember that Crappie has a mouth as thin as paper that rips easily! So do not set your drag all the way and let the fish wear itself out! 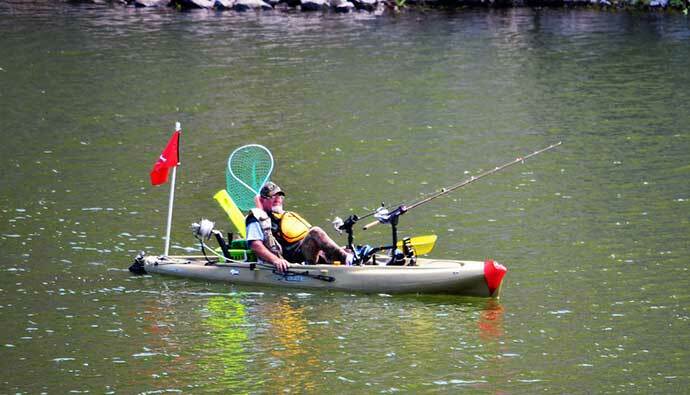 Fishing for crappie is very popular through most of North America. There are many methods, but the most popular is spider rigging. This is a method characterized by an angler in a boat with many fishing rods pointing away from the angler at different angles like the spokes in a bicycle wheel. Crappie is targeted by fly fishermen during the spawning period in shallow creeks, as well as ice fisherman target crappie regularly because they are still active in the colder frigid water. Usually, 1/8 oz Crappie jigs are used but anglers have been known to use a Crappie jig all the way down to 1/64 oz for a more finesse approach if they are hitting a little softer on a given day. As far as soft plastics go a small 2-inch grub or small paddle tail swimbait is the best crappie jig on a day they are feeding hard. However, on a day where finesse is required a 1-inch minnow or another 1-1.5 inch, micro lures absolutely do wonders on crappie that are holding to cover if you use a vertical jigging method. When vertical jigging you need to be near or right beside the piece of cover you are going to be fishing at, start right against the wall and let the bait fall to the bottom. Once you do this, you need to pull the bait up to you in a fluid up and down motion, slowly reeling in. If the water is fairly clear, try and keep your soft plastics natural colored, try and keep the plastics as close to what the fish would be feeding on naturally. On sunny days, the fish are getting a large amount of light penetrating the water. On these days you can pick just about any color you wish, but colors that are bright like yellow, chartreuse, and electric pink should be your go to. For when the water is darker, you will need to pick bright colors, anything that reflects light is a good choice as there is not much in the water for the crappie to see. If you are fishing with cloudy or overcast skies, you need to go a little darker with your baits, but you still need to choose something that has a small amount of brightness to it whether it be a spinner or a chartreuse tail. If switching your colors is not working try using a maribou jig they are fly like jigs that are made out of either synthetic hair or deer hair. Maribou jigs pulsate through the water as you retrieve them. An angler should never underestimate the use of live bait when they are targeting crappie. about anything that will catch a crappies attention will work. You do not have to be worried about the color of the bait, you are simply throwing them what they would be eating anyway. When it comes to crappie bait, minnows are the best at catching slabs out of the depths! Most anglers use a simple slip sinker bobber with a small split shot and a hook ranging from a size 12 all the way up to a size 1 bait holder hook. To begin you need a good sharp filleting knife. Cut behind the gill cover on both sides. Run your knife along the top of the back fin to the tail on both sides. Once you have made those cuts take your knife and run it along the backbone, once you reach the end of the ribs push your knife through till it comes out of the bottom on both sides. Start pulling gently on the fillet you have started cutting and slowly detach the meat from the rib cage with your knife. Once you have your fillets cut off be careful as the skin is very thin, start cutting the meat off of the skin and hold both in place while you run your knife along the skin, once completed you have a completely bone free crappie fillet! I always like to browse the web for the best crappie recipes. I stumbled upon these two from the the Crappie Fisher. Not a bad way to enjoy your catch! Start by fileting your crappie and then soaking them overnight in salt water. This helps to keep the meat of the fish nice and tender for cooking when caught fresh, otherwise, the meat can go soft and mushy if not soaked in salt water! Place the crappie filets into a glass bowl and pour in the buttermilk and generously coat each filet. Cover the bowl and allow the filets to soak for a few hours in the refrigerator for between 2 to 4 hours. Combine the flour, cornmeal, baking soda, and garlic powder into a smaller bowl and season with salt and pepper. Take out the crappie from the refrigerator and dip each fillet into the flour mixture, giving a generous coating for each filet. Heat the vegetable into a large skillet, heating to 350 degrees. Ensure the pan is deep enough to completely submerge each filet in oil. Dip the filets into the skillet and fry for a few minutes on each side – only fry 2-3 at a time to ensure the oil doesn’t overspill. Once fried for a few minutes remove the crappie from the skillet and place on a paper towel to soak up some of the excess oil. Garnish with a slice of lemon and enjoy! While pan fried crappie is unquestionably delicious, there are other frying methods worth a try, including this pan-seared crappie recipe. It’s much lighter than pan fried and really brings out the rich flavor of the crappie meat. Start by fileting the crappie before soaking them overnight in salt water if caught fresh – which hopefully most of you have done! Once left overnight, remove the filets from the saltwater. Season with salt and pepper. Melt the butter into a heavy skillet over high heat, allowing it to just begin to caramelize before reducing the heat to medium. Cook the crappie in the skillet, sticking to 2-3 at a time for the best results. Cook for a few minutes on either side, turning several times if necessary. You want the meat to take on a flaky texture – always monitor it to ensure it doesn’t overcook! Once cooked, garnish the crappie with sliced lemon and fresh parsley! Now that you know what crappie is and how to catch them, I hope you will go out and try your hand at catching these delicious fish yourself! Crappie fishing is a great way to get a little bit of change in your normal fishing types. If you have any tips that I missed in this article for catching crappie, be sure to let me know in the comments below :).